Kids do tend to turn out like their parents, but developmental research suggests parenting plays a bigger role in that tendency than genes. Nature may hand us some challenges, but through deliberate nurture, we can meet them. As parents, we desperately want to help our kids be as happy, healthy, and successful as possible. Many times we think of this in terms of avoiding the problems we’ve faced ourselves, in our family, and possibly we fear, originating in our genes. Taking a peek at how the brain develops and what environmental factors influence mental health holds good news for us in this regard: Our kids are not destined by the genes we (or our spouses) give them. Nurture matters. Parenting matters so much precisely because the human brain has an amazing ability to rewire (form new connections between neurons), not only to learn, but also to improve behavior and function and even recover from stress and trauma. This is especially true in the first three years of life, because the brain is not only able to rewire, but it’s actually wiring in the first place—forming the circuitry that will serve for life. Babies are born with very immature brains, with only 25 percent of their final volume and only the most basic functions to survive in place. The rest of the brain—including much of what we think of as emotional processing, social intelligence—wires in response to a child’s environment. By the age of three, your child’s brain is nearly 90 percent formed, but the frontal lobes—the planning and critical thinking part of the brain—continue to develop into your child’s twenties. During those dynamic first three years, the brain is most at work forming the foundations influencing emotional and social functions. This is a time when parental influence can have the greatest impact on future mental health because we humans, big and small, are such social and emotional beings. Allan N. Schore, PhD, at the University of California at Los Angeles School of Medicine, emphasizes the criticality of the parent-child relationship in shaping mental wellbeing in the first two years. “During critical periods, brain growth is exquisitely susceptible to . . . dysregulating interpersonal [emotional] experiences . . . which negatively impact infant mental health.” In other words, babies are extremely sensitive to relationship-related stress. And there’s good reason to believe this sensitivity persists well beyond the first year, though its influence on the formation of actual brain structures has largely passed after age two. Culture tells us that narcissism results from over-indulgence or “spoiling” our kids, but attachment research suggests this belief is backwards. Personality disorders are more likely to emerge from environments in which the child feels invalidated. More specifically, attachment shapes circuits in the early developing right hemisphere, “which for the rest of the lifespan is critical to the processing of emotions, social functioning, and stress regulation—all of which are problematic in personality disorders,” explains Schore. For Borderline Personality Disorder (BPD) specifically, Mary Gay, a licensed professional counselor based near Atlanta and past president of PDAN, says, “An empathically attuned parent can probably prevent the full manifestation of the disorder.” Gay adds that although a BPD parent might have difficulty meeting the needs of an at-risk BPD child, the key to prevention is in parenting from a securely attached relationship. This often requires treatment for the BPD parent. As critical to mental health as secure attachment is, the most recent large scale studies show over forty percent of the “non-clinical” population is not securely attached (58 percent are securely attached). According to Schore, this number is increasing. By ensuring the health of your child’s attachment to you, you can give him a real advantage, despite his genetic tendencies. When we respect, listen compassionately to, and look our kids in their eyes—as difficult as it is to do in our modern-day hustle—we’re giving them the best mental health insurance possible. Because the frontal lobes are unformed during the first year and their formation is not complete until adulthood, it’s safe to say young children are generally dominated by their emotions. (That’s why she seems so illogical when she gets upset!) Children who perhaps had compromised emotional environments during those critical first three years are likely going to be all the more challenging to parent with sensitivity, but it’s even more essential to provide them with a calm presence. When your child’s big emotions involve a sense of threat, it can be difficult to regulate them with logic; kids simply don’t have the ability to calm themselves down as well as we adults do. This means our kids really need our sensitivity to their emotions, even though their fears and frustrations may seem trivial or illogical to us. Seeing the world through your child’s eyes and supporting him when he’s scared or disappointed (some neuroscientists say the most painful of the raw emotions) not only helps build your relationship but also paves the way for your child’s own ability to self-regulate better as his brain grows. Acclaimed pediatric psychiatrist and trauma specialist, Bruce D. Perry, MD, PhD, explains that “states become traits”—if your child, particularly in the first three years, is often left in a fearful or angry state, those emotions tend to become persisting traits that can set him up for chronic psychological problems. Research shows that sensitive parenting with clear boundaries, rather than a harsh, authoritarian style better instills psychological resilience in our children, for life, by helping them regulate their emotions. How exactly do you apply this in the everyday? UCLA clinical psychiatry professor and prolific parenting author Dan Siegel, PhD, has been a thought leader on this topic. Siegel’s best-selling, The Whole Brain Child, is packed with practical advice on how to handle your child’s emotions when he’s melting down or blowing up. For example, Siegel suggests avoiding immediately appealing to his logic. Saying “Why are you acting this way?” doesn’t work well because it addresses an emotional problem using rational logic that calls for reflective thinking. This ability, immature to begin with, has been hijacked by the emotional parts of the brain. If your reaction is also inflamed (as understandable as it may be in light of his behavior), that further exacerbates your child’s run-away emotions. Instead, Siegal suggests first to connect emotionally by telling him, “I can tell that you’re really disappointed” in an empathetic tone of voice. Then, once he is more in control and receptive, redirect by bringing in the lessons and, if necessary, setting some boundaries for any misbehavior. Better communication with your child during those trying moments goes far in ensuring a strong relationship that will be a protective force for your child’s mental health, no matter what genetic vulnerabilities may lurk. There does seem to be a research-supported association between Attention Deficient Disorder (ADD) and other psychiatric disorders such as Conduct Disorder (CD), which is linked with criminal behavior and violence, mood disorders, and personality disorders. This, combined with the increasing rise in ADD (now 11% of school-aged kids, according to the CDC) is making it a focus of child mental health. According to Gabor Mate, MD, it all begins with chronic stress, starting while in the womb. Mate explains that each time stress causes the lower brain to interrupt and take the helm of a child’s mind, it interferes with normal focus and that (consistent with Dr. Perry’s “states become traits” principle) neurologically sets a child up for problems with distractibility later. In this way, stress can wire the brain for distractibility. To whatever degree Mate is right about this extreme nurture dynamic, the role of stress almost can’t be overstated. While there do seem to be genetic influences for ADD, a low-stress environment is imperative to ensure optimum mental health for all kids, but especially in families who’ve been stressed or in which other members already have a mental disorder. Stress-reduction measures, for example, avoiding over-structuring, bullying (especially sibling-to-sibling), or marital conflict (at least in earshot of the kids) are even more important for kids who already have ADD symptoms or have a history of stressful events. Perry has highlighted how seemingly benign incidents can bring about traumatic responses in young children. He, along with others in the neuroscience discipline, believes many ADD cases as well as CD cases are actually attributable to Post Traumatic Stress Disorder. A focus of Perry’s work has been on the power of loving relationships to heal traumatized children. This teaches us parents the importance of recognizing stress in our children and seeing it from their point of view, especially stress from relational conflicts. A central message of Dr. Perry’s books, such as The Boy Who Was Raised as a Dog, and his public outreach is this: psychological trauma is very responsive to relational repair. The best medicine for whatever has happened in your child’s past, or is currently happening in your child’s environment, is your loving, supportive relationship. Tiffany Field, PhD, the founder of the Touch Research Institutes (TRI), five centers worldwide devoted to the scientific study of how touch affects psychological and physical health, says our kids are “touch deprived.” Touch makes up a complex communication system in our brains and can be the most primal way to reduce stress and promote bonding. Young children need frequent emotional refueling through being hugged, rocked and held to literally grow their bodies and brains, as Field’s work exemplifies. But big kids need physical affection, too. Field says. Our schools are becoming touch-free zones and that is unnatural for healthy development. We parents have to make up this touch deficient at home. It’s important, of course, to follow your child’s lead and gage how she’s reacting to your increased affection. If your child is touch-deprived, you’ll likely need to ease into it. Older kids may also be self-conscious about needing hugs and soothing, so it’s always best to tune in and respond in stride. With soothing touch, kids’ brain waves indicate more alertness and they learn faster. Kids with ADD or autism also become more attentive, according to Field. Touch also alleviates depression by lowering those pesky stress hormones and increasing serotonin—the body’s natural antidepressant. These three simple, yet powerful parenting practices are examples of environmental influences that experts, like Schore, tell us influence which genetic attributes are activated . . . or not. Ironically, very recent genetic research indicates that genes may not just affect specific traits but also affect how susceptible an individual is to both positive and negative influences. In a new paper just published in December, 2014 in the journal of Development and Psychopathology, Jay Belsky, Ph.D., comprehensively lays out an increasing body of research supporting his “differential susceptibility (to environmental influences) theory.” After his synthesis of the genetic research related to social and emotional functioning (or development), it now seems clear that: some individuals are less affected by environmental factors, including those at the core of modern parenting debates, like early extended day care, “cry it out” sleep training, and even good parenting (termed “parental sensitivity”) in general. Belsky’s “differential susceptibility” is born out of recent genetic research identifying particular genes that are related to and thus may actually determine how malleable individuals are. For example, if you have a child with a genetic profile that makes him somewhat impervious to less than ideal environmental influences (such as a parent with a mental disorder or a history of harsh punishment), that child will also be less shaped by good parenting practices. On the other hand, if you have a sensitive, highly shapeable or “susceptible” child, you might have your work cut out for you in the early years (when negative influences throw him for a loop), but Belsky contends, “You get to play Picasso with this child—because he will benefit more from positive influences as well.” What this phenomenon suggests is that the risks associated with a variety of environmental factors do represent children on average, but not all children. Some are genetically more resilient. Others have more emotional needs or a more difficult temperament. So what determines our children’s psychological health? “We have to now move on both sides of the equation,” states Schore, “Biological reductionism is not giving us answers purely in terms of genetics. At the same time, theories which are totally environmentally driven won’t do it either. I think we’re at the point here of describing nature and nurture,” he says, “and that nature and nurture first come together in the mother-infant interaction.” It’s now believed to be both nature and nurture at the same time, interacting that determines how our kids turn out. Throughout childhood, you the parent matter. You being there, tuning in, and helping your child manage stress. What you do and don’t do influences how your child’s genes express. Vulnerabilities exist, both from nature and nurture, but overall, parents are empowered by nature. Angela Braden is a science journalist and a parent education consultant for the early childhood development think tank ZERO TO THREE. She blogs at www.sciencemommy.weebly.com. Follow Angela on Twitter @sciencemommyang. Great article. Well-researched and very nicely written. Thanks Angela! Parenting gives us the tools to improve the next generation. 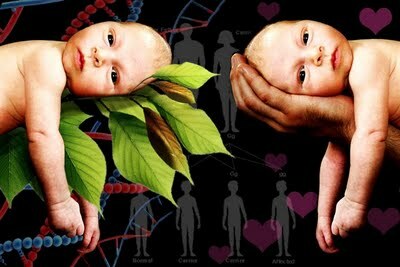 Our children are facing the gene challenges that life dealt us (with some choice) and dealt them (with no choice). Hope and positive nurturing are possible even if you are a single parent in a family where attachment disorders are part of your history. Applying the powerful, yet simple, parenting ideas in this article will help greatly – even if your children are not getting natural “secure attachment” from the other parent who created them. In other words, don’t spend much time focusing on changing the other parent. Instead, focus on your relationship with your children. Make that one count! !